NOTE: Before you can purchase our AutoFile Credits, you'll need to be on a TaxJar Annual Subscription Plan. If you haven't done so, follow these instructions here to learn how to upgrade to annual. 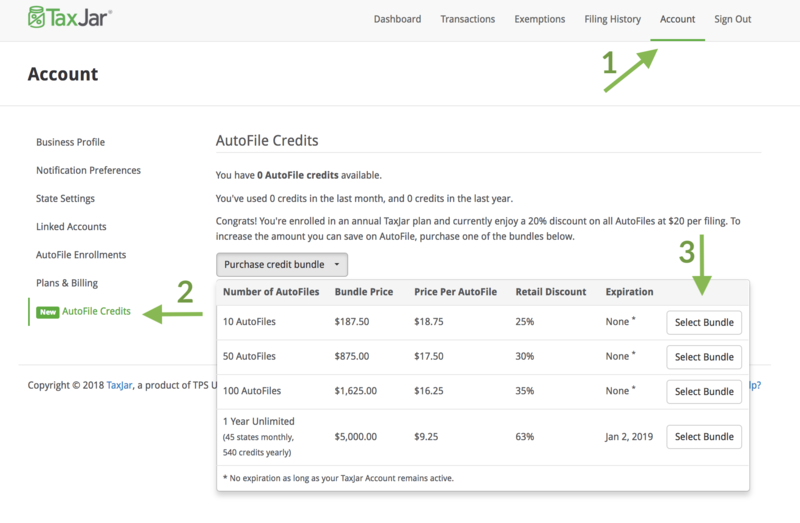 Once you've chosen an annual plan, you now have TWO options to help you get started in purchasing AutoFile Credits inside your TaxJar account. Option 1 (Quickest): Navigate directly by clicking this link if you are logged in to TaxJar. Option 2: Find the option inside your account by following the steps below. Follow the instructions on-screen to confirm payment and billing preferences for the Credits. Please note that AutoFile Credits are non-refundable.